Rachel Bilson has become quite the style icon since she broke onto the fashion scene as a star of the hit show The O.C. The actress even dabbles in design as a co-designer of the hit site ShoeMint. Want to steal her look? You’re in luck! Rachel always looks impeccable, whether she’s on the red carpet or running errands. Here, she shows us a fun way to dress down when the temps drop. The look is effortless and approachable, yet still has a cool girl factor to it. Love! Not every gal is a fan of a full, bulky winter coat. 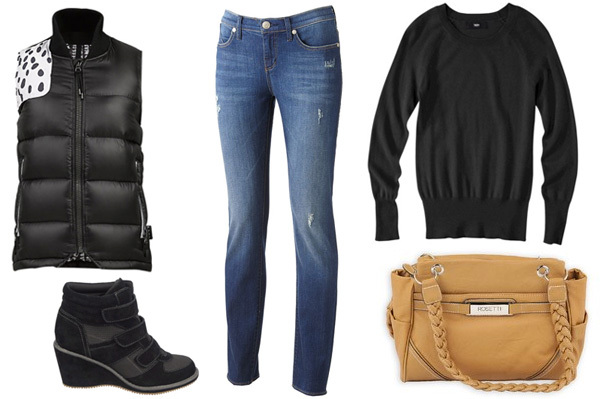 For days when there’s a slight break in the chill, opt for a puffer vest worn over a warm knit sweater. Pair the look with equally casual booties, a statement bag and some denim. You’ll be good to go!